The seemingly unending source of mobile device revelations that is the Boy Genius Report has uncovered and posted the first set of spy shots of the Palm Treo 850. The device looks to be a manifestation of the previously detailed model codenamed Palm Drucker. At first glance, the device looks to be a welcome depart from the usual Treo stylings and presents a more modern look with a blend of design cues from the Centro. The device would also confirm that Palm has an additional model on tap, in addition to the Treo 800w, first seen last week. BGR is reporting that the device is running a 400 MHz processor and reports 100MB of free RAM. The Treo 850 is also shown stacked up with a BlackBerry 8800, which helps us to gestimate that it's thickness is roughly around ~.55 inches (14mm), a noticeable reduction from Treo's past. The Treo 850 pictured in this set of spy shots seems to match up with some of the features listed in the leaked slide which detailed the Palm Drucker earlier this year. In particular, the slide described the Drucker as "Palms new ultra tier Windows Mobile 6.1 device and replacement for the 750v." It also listed a "flush" 320x320 pixel display, quad-band GSM/HSDPA capacity, WiFi, GPS, 1500 mAh battery and a 2 megapixel camera. Again assuming this is all still correct, the slide also pointed to a July 2008 release date along with a 270 euro (~$560) pricetag. This looks much better than the shots we've been seeing of the 800w. However, why another Windows device? Is it because this would be a non-CDMA device I wonder? Anyway, I hope the 800w looks as sharp as this one when it actually comes out. I'm rooting for you Palm. Ah, as I semi-predicted, that's POSSIBLY the Drucker (aka 800w GSM) we've been hearing about for quite some time. The big question is if this one indeed has the flush touchscreen as reported earlier OR if it's a high-end WM 6.1 Smartphone/Standard Edition device without a touchscreen. Either, it's oozing more style & sleekness than its CDMA sibling and is definitely the best looking Treo ever! One oddity is the lack of the "smile" QWERTY board. 2. A straight keyboard is easier/cheaper to manufacture and/or helps the device maintain compact proportions. 4. Palm is going to differentiate non-touchscreen WM Standard devices (ala Treo 500) & low-end POS/Nova devices (Centro) with straight keyboards and leave the "smile" shape to touchscreen-enabled devices. #4 is my guess. The broader "smile" keyboard shape will be Palm's equivalent to pricey ergonomic keyboards for desktop PCs. The post was in response to hkklife's which touched on the lack of curve of the keyboard. In 2002 RIM sued Handspring and they settled out of court (agreed to a per-unit license fee). Straightening out the keyboard eliminates conflict. The RIM patent applies to ALL keyboard styles (thumboards). The actual layout of the keys is irrelevant. Remember, SV, the Treo 90/180/300/600 brought about the litigation from RIM and none of those devices had a smile-shaped KB. In fact, the first Treo with a "smile" was the 650, which was released quite some time after Palm purchased the remnants of Handspring. AFAIK, RIM gets paid no matter what....which, perhaps even more so than the iPhone, might prod Palm into releasing a non-keyboard Treo in the distant future. Also, the leaked 800w (CDMA) shots clearly show a smile keyboard. Palm would not have let 2.5 years pass by from the 700w to the 800w and not reworked the keyboard IF it could protect them from RIM's patent. P.S. FWIW, I too thought that the straight KB eliminated the "RIM royalty effect" after seeing Palm release both the 500 and the Centro with that revised style. But all that changed when I saw the 800w leaked images. Furthermore, certain sources at TC (quite seemingly in-the-know-by-way-of-Palm-directly) support the theory that RIM's patent covers ALL front-facing keyboards from all manufacturers, smile or otherwise. Palm apparently just negotiated a better/lower royal fee for their thumboards. Oh come on! For Pete's sake, don't you guys LOOK at the older Treos before saying things like this!? The question is not "smile" but "curve", BTW. Take a look at an old RIM device while you're doing better research on TREOs - may I suggest Google Image Search? While you're at it, go back to TreoCentral in 2002 and read the posts all discussing this, especially the one(s) that note that RIM was WAY late to the party with small keyboards, but not the unique features they patented. Try searching for posts/threads with "rim handspring keyboard patent" to start. Its definitely a flush touch-screen WM 6 Professional device. Palm is finally releasing a device of the generation, rather than 2 years behind. Other then the rounded edges, doesn't it pretty much look like every other WM Smartphone? SV, I've used a Palm device since the original Pilot in 1996. I've seen every Palm OS device released over the past dozen years and am quite well-acquainted with the various styles of thumboards on Palm, Handspring and, yes, RIM products. I apologize for not distinguishing between "smile" and "frown" curved keyboards! They're nigh identical IMO (and, IMO, both are preferable to a straight qwerty board). Of course there was the fabled Nokia 9000 of 1996, which definitely set the trend for a totally wireless, dedicated wireless messaging/internet/voice platform. But in essense RIM's patents apply to devices using *optimized* non-square keys on small keyboards with functionality to send "advanced e-mail" instead of short SMS or alphanumeric pager messages. Now, what I would like to know (from anyone)...are ALL smartphone/QWERTY dumbphone manufacturers really paying royalties to RIM or just Palm back from Handspring's 2002 agreement? SV, you're good at deciphering/interpreting legalese--do you take that to mean only devices that have exposed curved QWERTY thyumboards? And not clamshell/flip/slide-out keyboards? So presumably Palm pays royalties on all of their QWERTY-based products, regarless of keyboard shape (curved=most Treos, straight=500v, Centro) due to Handspring's prior licensing of RIM's patents? I tend to favor part of theory "2," the straight keyboard makes it easier to create a more compact device. Comparing my Treo 680 to my 600, the smile keyboard is just as wide as the straight one but significantly taller. The 600's keyboard is a little less than an inch high while the 680 keyboard is about one and a quarter inches from the bottom of the spacebar to the top of the smile. That's a pretty significant chunk of real estate when you are trying to shrink a relatively large device. I don't know what unique feature of Rim's keyboard patents was the one (or ones) in dispute and for which Handspring got a license from Rim at some cost (per unit, I'd bet). But the patent(s) for SURE mention curved keyboards (as well as tilted keys or something like that). Since we KNOW Rim's keyboard SIZE wasn't at ALL unique (nor original), then necessarily it had to be something else. And we KNOW it was something VISIBLE, not some programmatic activity. That doesn't leave a whole lot left, huh? There was no court case follow through, BTW - Handspring simply said "Okay, we'll deal" without a legal substantiation of RIM's claims. Looks better that those 800W pics from last week. Very busy looking as far as all those buttons, but I think it will do well with WinOS business types. 2. A slimmer and/or sleeker GSM 800w/850w with a flush touchscreen, as seen on the Vodafona leaked slide from a few months ago. 3. THIS device seen here (is this perhaps the Skywriter? as a GSM WM Standard midrange unit. This could be a nice middle of the road device slotting in between the 500 and the 800/850. looks like good build quality but unfortunately, there's nothing special about it. palm needs a hail mary to save them and this ain't it. I'm thinking these new WinOS based devices will carry Palm until new linux based OS is released. The roadmap for Palm has been discussed and we all know that the big make or break will happen when the new Palm OS is ready. The devices will "carry" Palm only if they sell; given their appearance and feature set (whatever that is!) we should assume Palm will be lowballing the price to move them out the door. I don't think Colligan will get it, however, and don't think Rubenstein (sp?) will be involved with it, so I'd bet that Palm will have some outrageous price on these for introduction (that is, to hit the early-adopter crowd - if there are any left), then lower them almost immediately when they find zero sell-through. ...let's all ask for the source code when it's "released"...er..."delivered"...er..."ready"...I guess...at the end of the year! That good old Linux License Terms rears its beyooteeful head! Yet Another Crappy Windows Mobile Device sucking up resource which should be working on their new platform. Imagine if Apple had followed Palm's path and was currently shipping a lineup of antiquated G3 Macs running MacOS 8.9999 paired with underspec'd/overpriced PC's running XP. Amazing to watch a market leader become a market also-ran. The CEO and CFO both have now repeatedly said the Windows phones are almost entirely outsourced. That is, essentially no resource other than bucks is expended on them and, one would hopefully assume, they get those bucks back with interest. Not that I beg to differ (I don't) but certain, ahem, possibly-in-the-know-direct-from-Palm sources beg to differ on your theory about ALL of Palm's WinMob efforts being outsourced. Supposedly "optmizations" have been done to the 800w/850 (the 800w is indicated at having more available RAM than comparable WM devices, for example). But couldn't MS or one of the ODMs just as easily perform these optimizations? I personally feel that Palm is hoarding $ and (after the final POS device as the Centro) designing only hardware to run on Nova in-house and that these are "customized" (not me-too efforts like the 500v) from a good ODM. Now, my other pet theory is that IF Nova does ship in 1st half '09, we will see it debuting on what is essentially "800n" or "850n" hardware or perhaps as the first of the 900x series. So if Palm is going to get that kind of mileage out of this hardware than it IS entirely probably that Palm might have made a special case and done this pair in-house. The 800w looks like an old-school Palm regime product, which is entirely unsurprising given how long it's been in the works. The 850 does look like the first device which might have a smidgen of Rubinstein design influence, however. Good lord - never EVER cite that poster if YOU want to retain ANY hint of credibility. Anyone has any idea what are these yellow dots on Dial/Y/S/C/Alt buttons for? Just another way to encode the unique unit number so leaked images can be traced back. I hope that this is not the other way around with this being the Treo 800w. It looks cheap but I can't complain. I have the 700p for christ sake! Doesn't matter to me because I will be in line for the next great TREO! Looks like a 500v Deluxe. But it is thin .... wow on that front.! > ...But it is thin .... wow on that front.! However, it gives the impression of being thin by curving all for sides in. I have to say I was really disappointed when I saw the 800. It does look like the same old thing. Try something new!!! I am liking the look and specs of the 850, assuming they are true. I have a Palm TX, and I want to jump into the smartphone world. I'm guessing we will not see a new Palm OS device until 2009, so I might end up with a Blackberry. I really think Palm needs to push themselves to stay relevant. There is so much buzz about new iPhones and Blackberries, that they are going to get left in the dust if they wait until next year or the end of '08 for something truely new. 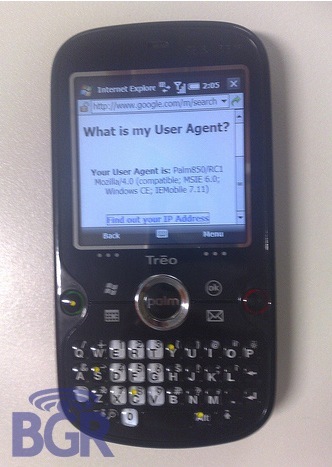 This is a refresh for the WinOS line of Treos, you will not see anything new from Palm until next year. How about a Centro if you want to get into smartphones? i thought about it, and my other half had the most recent Treo until she went to get a Blackberry. The current Treos are too bulky for me, and seem to still have issues with having lots of hard re-sets. I thought about a Centro, and I'm not sure it has enough power for me. -Possibly reduced battery life, depending on how much you use it. My advice? Unless you absolutely MUST have a converged device and/or MUST have greater wireless coverage than wi-fi affords, hang on to the TX until 2009 and see what ALP, Nova, and yes, WM7 bring forth. I also use my TX everyday at home for quickly checking email and limited surfing and im's. But I'm thinking of going to the Centro when its released on VZW. Cost is a big factor for me, the upfront phone cost and the monthly data plan. So that's why I think the Centro will work for me, low cost smartphone with VZW $30 data plan (wish its was lower). So you would rather pay $30 a month for a data plan with smartphone then use the TX? I must be really gettin' old because the last thing I would want to do is surf the web on a Centro. I'm never that far from a Wifi spot or a computer to access email that I would even consider paying for a data plan. Now if my employer wanted to pay for it, that's a different story. You must also not really use your device for anything more then games because you'd better carry a magnifying glass with you if you want to do any serious "PDA" type work on it. Maybe your one of the kids that text message but for us "older" people who have grown accustom to a stylus over the years that little keyboard would drive me insane. P.S. I still think you (Palmit) are a Palm employee. My employer does allow me to expense cell phone usage ($45 per month) and I'm a long time Palm user (dont work for them). I recently went to a Cisco meeting in NYC and everyone pull out Thinkpads. For a second I thought it would of been cool using my TX, but its so out of date I would of felt funny using it (especially at a hi-tech place) If I get the Centro I'll use it for some business (checking emails)and for personal use. You make it sound like the Centro is basically a toy or for young people only. I'm going to check it out with my thin fingers and still good eyes! You make it sound like the Centro is basically a toy or for young people only. I'm going to check it out with my thin fingers and still good eyes! Well it is compared to the Treo or most WM smartphones. Even Palm says "It's not for meetings, It's for meeting up". I carry a laptop, TX and cell phone around for work. The laptop usually stays in the trunk while I use my TX quite a bit. I'd be much more lost without the TX then either the cell phone or laptop.